Sunday’s men’s 15-kilometer freestyle individual start race in Falun, Sweden, was the final European stop for the World Cup. With the race concluded, athletes will pack up ski bags, moth-ball the wax buses, and jet across the Atlantic. Next week athletes will race amidst the crowds and city-scape of Québec. The final Euro-leg of the World Cup saw Alexander Bolshunov of Russia win his third individual race in a row. His top-step effort was his fifth win of the season. 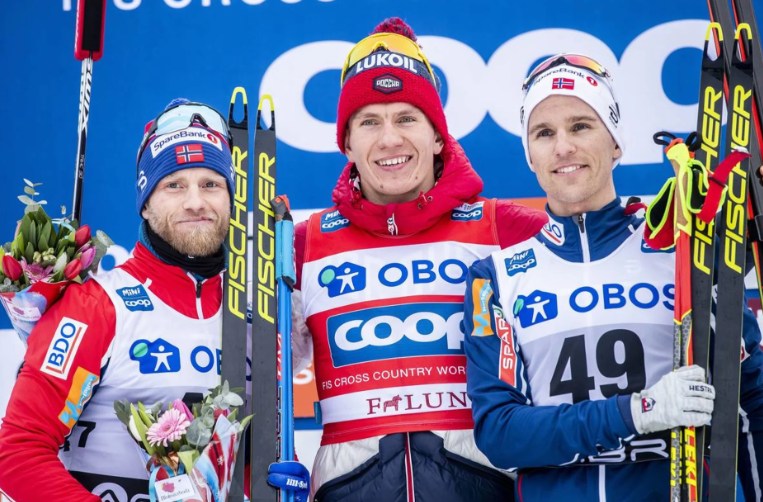 Norway took the next three spots with Martin Johnsrud Sundby in second, Didrik Tønseth in third and Sjur Røthe in fourth. During the first 5k of the race Bolshunov moved up through a tight pack clustered near the top of the time splits. After his first 5k lap, Bolshunov held a 4.4 second margin over Russia’s Alexey Chervotkin at 5k. Sundby kept it real for Bolshunov coming through at 5.6 seconds back. With the relative luxury of a late bib start, Bolshunov wore bib 69, Sundby 47, the Russian could push towards the redline of effort knowing precisely where he stood against Sundby. At the 10 k mark Sundby was a an eyeblink back amounting to 0.4 seconds behind Bolshunov. In other words, Bolshunov understood his race lead margin was thin. With 2 k remaining, Bolshunov had a pad of 3.1 seconds. That buffer would have been enough as Bolshunov finished today’s race in a time of 33:18.6. Sundby placed second, 8.9 seconds back. Along with the day’s top prize, Bolshunov seized for good the overall distance crystal globe. The twenty-two-year-old Russian began the distance crystal globe campaign with the first race of the season, a 15 k classic win in Ruka, Finland. Along the way, Bolshunov collected seven distance podiums, including Sunday’s win. His streak of three successive World Cup distance wins includes a 15 k classic in Cogne, Italy prior to World Championships. He then followed that with a win in the Holmenkollen 50 k classic. Canadian skier Alex Harvey was the first North American to cross the line finishing 11th overall. During the second half of the race, Harvey skied from 21st to 11th, he finished +1:10.9 behind Bolshunov. David Norris (APU) of the U.S. was the top American finisher. 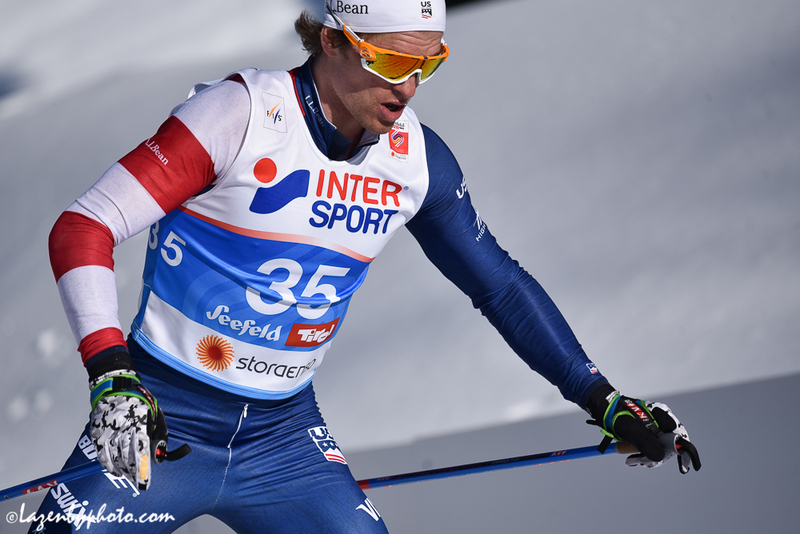 In Falun, he finished 16th for a career best individual World Cup result. The success curve of late for Norris has been remarkable. The twenty-eight-year-old Anchorage based athlete has been a highlight for U.S. men’s distance skiing. The man has a motor. Ask the field contesting the Mt. Marathon race in Seward, Alaska. He’s a multi-time winner. The motor has now been fine tuned to excel in wintertime Europe. He placed 20th in the 2019 World Championship 50 k mass start skate. He proved that mark was no aberration with a 24th in the Holmenkollen 50 k mass start classic. And then Sunday was a bump in the standings for that 16th place. According to Norris, he’s more likely to push on the climbs and recover on more variable terrain. He attributes some of his success to making subtle pacing changes. “My usual tendency is to focus on the climbs,” Norris wrote. “I have been working on relaxing a bit on the climbs so that I can focus more on pushing the gradual terrain. I know I can climb well, but if I emphasize that too much I tend to lose time over the rest of the course. During a year when the U.S. Ski Team has offered numerous international starts to a host of non-USST members, Norris and his trifecta of results in the points promotes the notion that on the right day and even the right World Cup string of races, elite U.S. skiers can step up.